When I bought this dress, I was thinking about wearing it around the Easter holidays. 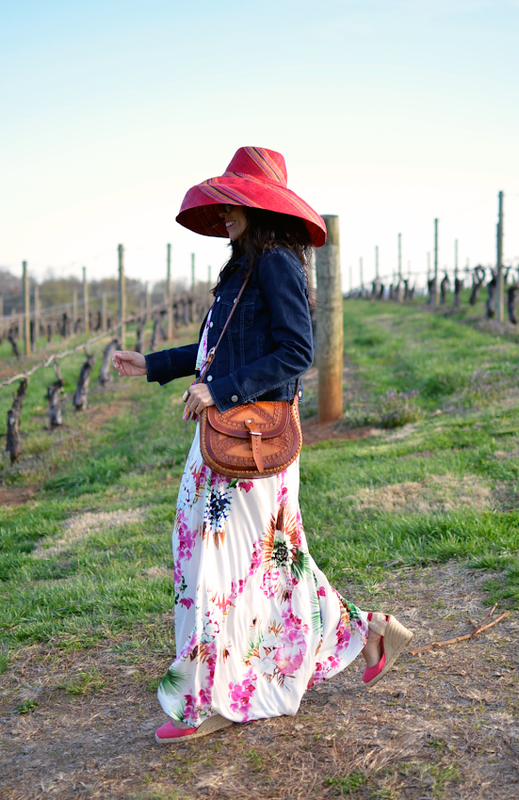 Obviously I couldn't wait until then and instead I wore it earlier in the week with ethnic accessories to go on another fun and relaxing trip to a vineyard. Cuando compré este vestido, lo que tenía en mente es ponérmelo en la Semana Santa. Obviamente, no me pude esperar hasta entonces y me lo puse esta semana con accesorios étnicos para ir a nuestros paseos tradicionales de viñeros. Dress/Vestido: H&M (Sold out). Check THIS gorgeous alternative. Espadrilles: Christian Louboutin. I love THIS denim style, they are even more versatile. I am dreaming of summer - in this dress! Fabulous look, dear! I am too!!! I can't wait for warmer weather myself. Thanks Annette. I love this combo, it's so very summery. Ah yes dear, excellent use of the bit of wind! This is hard to do. Love the dress with red. I'm taking your lead, trying more movement in my pictures. You are one inspiring lady, your blog is wonderful! It was so windy up in the mountains, but we worked with the wind and came up with cute pictures. Thanks Ann for support. Pretty photos! You look gorgeous in this dress and the hat is amazing!! So pretty! And wonderful photos too. What a beautiful dress, you make me wish winter was over, and it's only starting! You look very feminine and stunning! That dress is gorgeous on you, I love the white with all of the fun, bright pops of colors! Love your dress, Carelia! And so chic with the hat - oh! I am looking for a dress with such lines myself, they are so indefinitely feminine! I am sure you will find it soon! Right now all the stores are bringing so many floral maxi dresses.